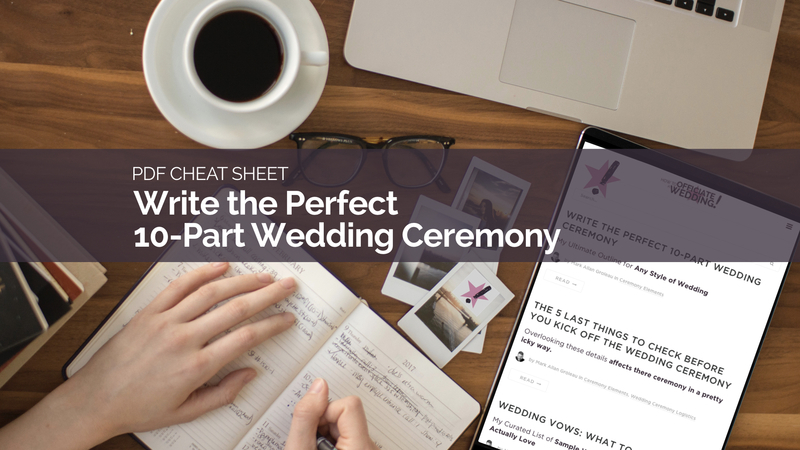 So you need to write a wedding ceremony script and officiate a wedding. Instead of grabbing a canned pre-written sample from one of the 879,695,691 webpages out there, start with my 10-part wedding ceremony outline instead. A canned script is restrictive right out of the gate. It says, “I’m not really sure what I’m doing.” When we use a wedding ceremony outline, it communicates to our couple that we’re both structured and flexible. The process ends up being way more collaborative, and the finished ceremony ends up being way more personal. It’s the difference between “Hey, I bought this cake. Now eat it,” and “Hey, let’s make a cake!” Or something. Call up your couple, sit down with them for an hour over a drink, and brainstorm through this standard 10-part wedding ceremony outline. Talk over the personal elements they might want to add. I’ve included some of the most common variations when relevant so you can discuss some options. Here is the ceremony outline I start with for 100% of the weddings I officiate. The wedding officiant takes the front with Partner 1 and Partner 1’s party (down the aisle or from the side), and then the officiant makes some brief opening remarks. Announce whether photos are allowed. Ask guests to please turn phones to silent. “With that, let’s begin!” That’s the cue for the processional. After the officiant and Partner 1 and Partner 1’s party enter, maybe some grandparents or other important family members enter and are seated in the front row before the officiant speaks. If Partner 1 and his/her party are part of the processional, the officiant can enter alone and make the opening remarks alone before anyone else enters. The music starts, and the wedding processional begins. Ring boys and/or flower girls and/or junior bridesmaids enter. Partner 2’s party enters in single file. Partner 2 enters with parent(s), walk the aisle, and stop at the front row. Partner 1 steps forward to receive Partner 2 at front row. Partners and parents exchange handshakes, hugs, and kisses with parent(s). Partner 1 and Partner 2 stand in front of the officiant, facing each other holding hands. The officiant invites guests to be seated. The ring boys and/or flower girls and/or junior bridesmaids can enter either first in the processional or just before Partner 2. What makes today so important in the life of this couple? It’s the promises they are making to always be there for each other (“vows”) in front of their closest friends and family. Here’s where the officiant says some things about that. add some prayers or blessings from the couple’s religious tradition. How do we know if we have to include these things in the ceremony? Google up on the laws in your state or province. This is when the couple makes promises to each other. It’s kinda the biggest part of the day. No pressure. Have no fear! See my two blog posts on the three ways to say wedding vows and my curated list of favourite wedding vows. The Best Man is usually holding both rings. The officiant states that the couple will now exchange rings as a physical symbol of the promises they’re making today. The Best Man gives Partner 2’s ring to Partner 1. Partner 1 slides the ring on Partner 2’s finger. The officiant asks Partner 1 to repeat a few lines about giving this ring as a symbol and a reminder of his/her commitment (i.e. “I give you this ring/as a sign of my commitment to you.”). The officiant gives the ring to Partner 2. Partner 2 slides the ring on Partner 1’s finger. The officiant asks Partner 2 to repeat a few lines about giving this ring as a symbol and a reminder of his/her commitment (i.e. “I give you this ring/as a sign of my commitment to you.”). Some officiants put this element after the signing, but I like to put it before. That way, everyone has clapped and cheered and the signing is more relaxed with a party-like atmosphere, rather than stiffer and more ceremonial. Is this a legalization ceremony? The officiant tells the guests that the couple is going to sign some papers and we will all be back in just a few minutes. If the officiant is legalizing the ceremony (or someone else in attendance is doing that), head over to the table and sign with the required number of witnesses (usually the Best Man and Maid of Honour). When finished, everyone comes back to the centre as before and the officiant gets ready to make some closing remarks. Sometimes the couple opts to do this in private with the witnesses before or after the ceremony. Some countries do this before or after the ceremony, so you can leave this out if it’s not customary where you’re from. “Finally, stand with me now; it is my distinct honour to present to you for the first time: _______ and _______ as husband and wife/married!” or an alternative (i.e. “Mr. and Mrs. _______!”). The recessional music starts immediately. The couple heads up the aisle. When the couple has cleared the aisle completely (no photo-bombing and traffic jams! ), the two wedding parties follow in pairs, linking arms and starting with Best Man and Maid of Honour. The officiant goes to Partner 2’s family, offers congratulations, and motions them to exit up the aisle. The officiant goes to Partner 1’s family, offers congratulations, and motions them to exit up the aisle. Finally, the officiant stands and motions the subsequent second rows to exit. Now, one thing to note here at the end. This is a standard 10-part wedding ceremony outline. Our couple may expand it out to 22 parts or 648 parts by adding readings or rituals involving multiple family members, fire, sand, doves, F-18 flyovers, clowns, alcohol, etc. Just go with it! And remember: it’s not our job to coordinate all the minute details like bringing all the candles and birdcages! Our role as Officiant is to facilitate and accommodate what they want their ceremony to look like and make the space for it to happen. Use my standard 10-part ceremony outline as a starting point, and mould any style of perfect wedding ceremony from there. Now get out there and make the best. Ceremony. Ever.